A couple weeks back, I wrote how the Gospel seems to threaten to make Chinese people into cultural orphans. In discussing some ways to encourage Chinese people who feel that pressure, I mentioned the role that church history can play. Connecting a new Chinese believer to the history of two thousand years of preachers, missionaries, theologians, and martyrs shows him that he is far from alone in his faith. This is true of church history in general, but this is perhaps even more true of Chinese church history. Sure, the history of Christianity in China isn’t as rich as many of our western nations, but the history that is there is all the more vivid to Chinese believers, as it is painted in hues they easily recognize. Last summer we took a week in each of the churches to highlight the life of one of the most influential Christian leaders of China’s past. It was a very helpful study, and this idea is something that we will likely continue in years to come. The subject of last year’s biographical study was Wang Mingdao, a pastor in Beijing who was imprisoned from 1955 to 1980. He died in 1991 at the age of 91. The changes that he lived through in China were enormous, as was the price he paid to follow Christ all those years. I would like to share a few of what I see as the central emphases of his life, and then cautiously put forward a couple of thoughts about his more troubling weaknesses. But first, let me try to give you a very brief biographical outline so that you can get an idea of the large movements of his life. Wang’s father, a doctor, committed suicide before his birth, apparently gravely stressed by the ongoing chaos of the Boxer Rebellion. Raised by his mother in great poverty in Beijing, he was converted at the age of 14 at the Christian school where he studied. An older boy in the school began to instruct him, showing him how to read his Bible and pray. At this early age, Wang wanted to be a politician – his hero was Abraham Lincoln, and he dreamed of having a similar influence on his own nation. There was also a part of him that wanted to preach the Word. And it was this latter desire that would characterize the rest of his life. He took a job teaching at a Presbyterian school, where he continued to grow in his faith, following particularly the writings of an influential author who worked with the YMCA named H. L. Zia. At the age of 20, he had some kind of powerful experience of spiritual conviction that served as a catalyst for his life’s ministry. He then received believer baptism and was as a consequence dismissed from his teaching position. At the age of 21, he began to preach, and by 23 he was being invited to travel to various Christian meetings as a speaker. A dissatisfaction with what he felt was the compromised and unhealthy state of the Chinese churches of his day soon became the hallmark of his preaching. He criticized the churches for their acceptance of unregenerate people as members. Perhaps it was only to be expected then that in his late 20’s he would start a church in his own home. This church grew quickly and eventually became known as the Christian Tabernacle of Beijing. He married Liu Jingwen at 28 and they had a son two years later, Wang Tianzhe. By this time he was traveling extensively. He had also begun the publication of what would become an extremely influential newsletter for Chinese Christians, the Spiritual Food Quarterly. 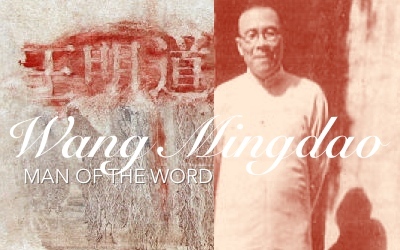 In his mid-thirties, his church constructed a building that could seat several hundred people and remained one of the largest evangelical churches in China throughout the 1940s. When the Japanese invaded and occupied Beijing through World War II, they tried to force all churches in Beijing to register in a Japan-controlled federation. The Japanese claimed that the churches were all instruments of western influence. Wang refused and became the target of many threats from the Japanese. He feared (probably rightly) for his life through this time, but he refused to give in, unwilling to allow his pulpit to become a mouthpiece for the Japanese. Eventually a spy was stationed by the Japanese as a gatekeeper for the Christian Tabernacle, but nothing further came of the threats. After World War II, the Communist party led by Chairman Mao established their control over China. Again the churches were deemed corrupted by foreign powers and again the leaders faced an ultimatum: register with the government-sponsored network of churches or else! Again Wang boldly refused and denounced the movement in the Spiritual Food Quarterly. Resisting all pleas to give in, an accusation meeting was held in 1954 where Wang was publicly declared to be worthy of death. Nothing more would happen, however, until August of 1955. Wang and his wife – as well as eighteen other church members – were arrested. The Christian Tabernacle was closed. After a brief imprionment, Wang signed a confession of his crimes – which he then was forced to read to the gathered members of the government church network – and was released from prison. This seems to have had a profound effect on his mental state. Deeply distraught, it was said that he would mutter to himself over and over that he had denied the Lord. In 1957, he turned himself into the police, stating that he had made a grave mistake and that his confession was false! Back to prison he went, where he would remain until his release 1980. By then an elderly man, he lived with his wife until his death in a small apartment in Shanghai. He received many high-profile visitors over the following years, though he would not again take up a position of church leadership. Wang Mingdao died on July 28, 1991 of blood clots on his brain. A life that testifies to the unsurpassable worth of following Christ, to be sure! I found that his story was a great challenge and encouragement to the Chinese believers in our churches, and I hope it has been to you as well. Next post will attempt to show some of the unique emphases that made Wang’s life so extraordinary.